How can I find something to borrow? You can browse books on the homepage, or select a category from the Subjects, Collections, or Levels menus. Or, if you know what you want to look for, use the search bar. This is good for searching by title, author, or keyword. For more search options, select Advanced Search. You can also add titles that your school doesn't own yet to your search results. Then, you can recommend those titles to your school. What do the icons on the covers mean? 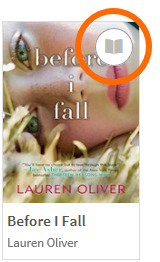 The icon in the corner of each title tells you whether it's an eBook, audiobook, periodical, or video. Titles that are available to borrow have filled-in icons. If all copies of a title are checked out, the icon is grayed out. How do I borrow titles? Move your mouse over a title (or tap it on a mobile device), then select Borrow. Or, select more to see the title’s details page. From here, select Borrow to borrow the title. 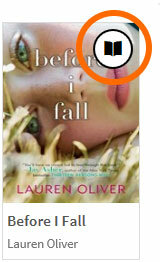 Note: Magazines and newspapers have a Send to NOOK app button instead of a Borrow button. Click here for more information about how magazines and newspapers work. If prompted, sign in to continue. 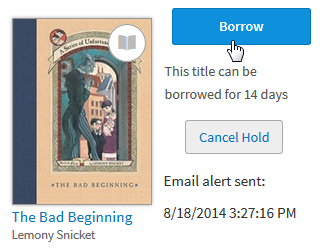 You can find borrowed titles on your Checkouts page (under your Account). How do I renew titles? Renewing digital titles works a little differently than renewing physical books from a library. When you renew a digital title, it lets you borrow the title again right after your current checkout expires. The Renew link becomes available three days before a title is set to expire and appears next to the title on your Checkouts page (under your Account). If the title already has holds, you can't renew it, but you can request it again. 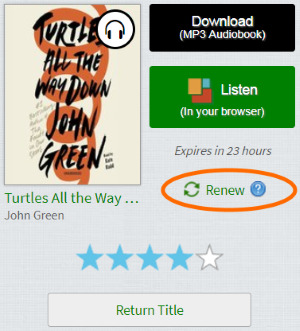 On your Checkouts page, select the Renew link next to the title you'd like to renew. Note: This link doesn't appear until three days before the title is supposed to expire. If prompted, enter your date of birth. Enter and confirm your email address, then click Renew. If you want the title to be automatically borrowed for you as soon as your current checkout expires (instead of being held for you on your Holds page), make sure that "Automatically borrow this title at the time of renewal" is selected. 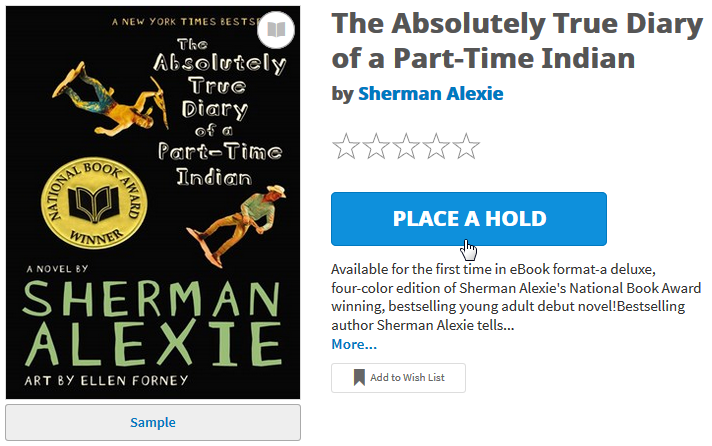 A copy of the title will be placed on hold for you, so you can borrow it again right after your current checkout expires. You can tell that you’ve successfully renewed a title when you see a checkmark and the word Renewed next to that title on your Checkouts page. As soon as your current checkout expires, you'll receive an email with a link to find the title on your Checkouts page (if you had it automatically borrowed for you) or telling you to borrow the title again from your Holds page. 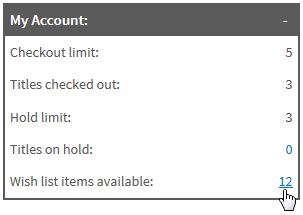 As soon as your current checkout expires, you’ll see a notification next to the Account icon on this website. This means that the title is available for you to borrow again from your Holds page. Once the title is available for you to borrow again, you'll only have 3 days to borrow it, so please check this site often to make sure you don’t miss any notifications. Please note that renewing a title does not mean that it is automatically re-downloaded to your computer or device. If you would like to re-download a renewed title, you'll have to go back to your Checkouts page and select Download (or Add to app) again. Why do I see “Request Again” for a title I borrowed? If a title that you've borrowed has holds, you won't be able to renew it. Instead, you can use the Request Again link to place a hold on it, so that you can borrow the title again as soon as it's available. The Request Again link becomes available three days before the title is set to expire and appears next to the title on your Checkouts page (under your Account). 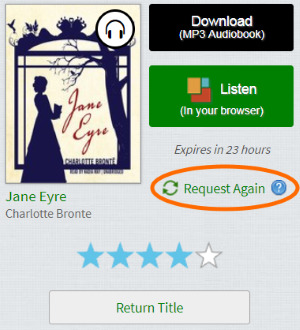 On your Checkouts page, select the Request again link next to the title you'd like to borrow again. Note: This link does not appear until three days before the title is supposed to expire. A copy of the title will be placed on hold for you, so you can borrow it again as soon as it’s available. 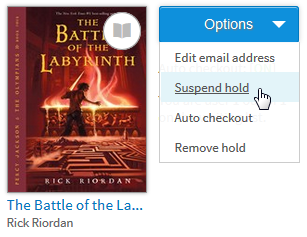 You can tell that you’ve successfully requested a title when you see a checkmark and the word Requested next to that title on your Checkouts page. As soon as the title is available, you'll receive an email with instructions to find the title on your Checkouts page (if you had it automatically borrowed for you) or to borrow the title again from your Holds page. As soon as the title is available, you'll see a notification next to the Account icon on this website. This means that the title is available for you to borrow again from your Holds page. Once the title becomes available, you'll only have 3 days to borrow it, so please check this site often to make sure you don’t miss any notifications. How do I put an unavailable title on hold? If a title isn't available, you'll see a Place a Hold button instead of a Borrow button. 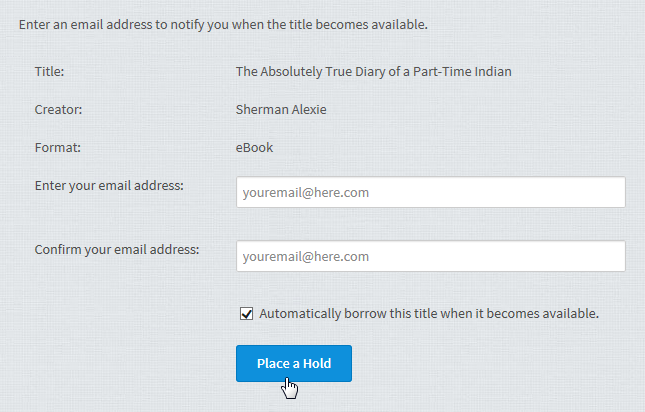 Follow the steps below to place a hold and be notified when the title is available for you to borrow. Move your mouse over the title (or tap it on a mobile device), then select Place a Hold. Or, select more to see the title’s details page, then select Place a Hold. Enter and confirm your email address then click Place a Hold. 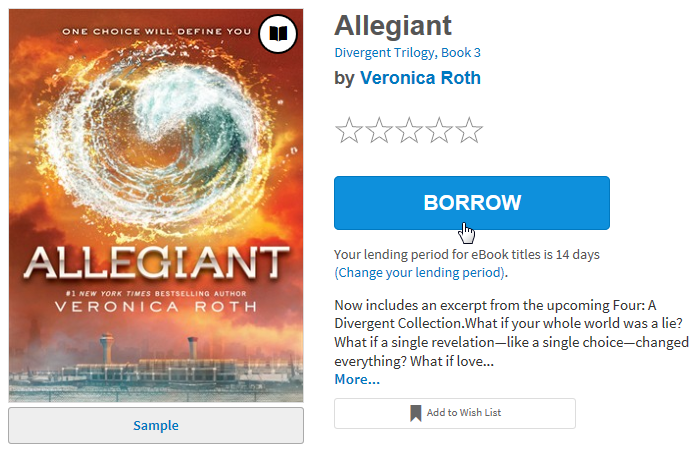 If you want the title to be automatically borrowed for you as soon as it's available, make sure that "Automatically borrow this title when it becomes available" is selected. You’ll receive an email notification as soon as the title is available to borrow (or as soon as it’s automatically borrowed for you). The title will be automatically placed on hold for you. When it becomes available for you to borrow, you'll see a notification next to the Account icon on this website. Once a hold becomes available, you'll only have 3 days to borrow it, so please check this site often to make sure you don’t miss any notifications. How do I borrow an available hold? Click or tap the Account icon. Select the Borrow button next to your available hold. If you’re over 13 years old, you can also have your holds borrowed automatically for you as soon as they become available. What is the “suspend hold” feature? You’ll find the “suspend hold” feature in the Options menu next to each title you’ve placed on hold (under your Account > Holds). Suspending a hold lets you choose a window of time where you'll continue making progress on the title's holds list, but the title won’t become available for you to borrow. For example, you might want to suspend your hold on a popular eBook if you’re getting near the top of its holds list, but you know you won’t be able to read it if it becomes available soon because you're in the middle of reading another book. See this help article for more information on how to suspend a hold. How do I recommend titles for my school’s digital collection? Using this website, you can browse through titles that your school doesn’t own yet. You can then recommend titles to your school. Once you select this button, the site will run your search again, adding titles your school doesn’t own yet into your results. You can then continue to sort and filter your results to find exactly what you’re looking for. Note: Another way to add recommendable titles to your search results is by selecting Additional Titles to Recommend in the search filters (if available) or in the advanced search. 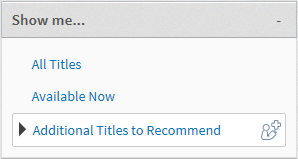 To figure out which titles you can recommend, look for the recommend icon. To recommend a title, mouse over it (or tap it, on a mobile device) and select the Recommend button. When you select Recommend, you’ll be taken to a new page. If this is your first time recommending a title, you’ll be asked to enter your date of birth. Click or tap Recommend this title. If your school buys the title, you’ll be added to the wait list so you can borrow the hold when it’s available. Note: If you’re over 13 years old, you’ll have the option to receive an email notification as soon as the title is available to borrow (or as soon as it’s automatically borrowed for you). Once you’ve recommended a title, its button will change to Recommended. You can only recommend each title once. You can see all of the titles you’ve recommended to your school under your Account > Lists > Titles you recommended. How do I make a list of titles I want to borrow later? You can use your wish list to make a list of titles you want to borrow later. To add a title to your wish list, mouse over the title (or tap it on a mobile device) and select the ribbon icon in the bottom-left corner. When a red ribbon appears on the cover, the title has been added to your wish list. You can find your complete wish list under your Account > Lists > Wish list. You can see how many titles from your wish list are available by looking at the “My Account” box that appears on any page under your Account. Click or tap the number next to “Wish list items available” to view and borrow your available wish list item(s). Watch how-to videos, find answers to your questions, and more. Download free software required for digital titles. Find out more about where standardized reading levels come from and what they mean. Still need help? Contact Support. You've reached your checkout limit. 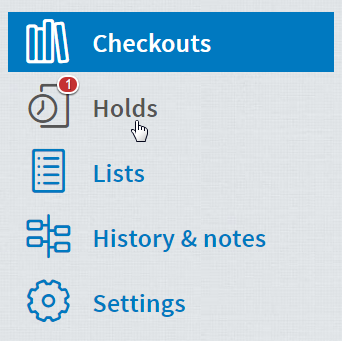 Visit your Checkouts page to manage your titles. You already have this title checked out. Want to go to your Checkouts? You have reached the maximum number of titles you are allowed to recommend at this time. You can recommend up to 99 titles every 1 days. Sign in to recommend this title. Recommend this title for your digital library. Availability can change throughout the month based on the library's budget. Once playback starts, you have hours to view the title. There are no copies of this issue left to borrow. Please try to borrow this title again when a new issue is released. Some format options have been disabled. You may see additional download options outside of this network. You've reached your library's checkout limit for digital titles. To make room for more checkouts, you may be able to return titles from your Checkouts page. There have been too many titles checked out and returned by your account within a short period of time. Try again in several days. If you are still not able to check out titles after 7 days, please contact Support. You have already checked out this title. To access it, return to your Checkouts page. This title is not available for your card type. If you think this is an error contact support. If this problem persists, please contact support.